I just took a bundt cake pan and baked a chocolate cake. I iced the cake in chocolate frosting. I printed the Angel "Praise The Lord" Template out. I cut it out and laminated it. I then took two toothpicks and taped them to the back of the scripture. One on each side. I stuck the angel right down in the middle of the cake so it would cut through the cake. This will hold it up. I stuck the scripture right in front and pushed the toothpick down in the cake. I then decorated the cake in smarties candy and suckers. I just pushed the suckers through the cake. This gives it a neat looking appearance.I laid 5 candy canes around the cake on the pan. I made this cake for the kids to eat at Children's church for a snack. I am using this with the Angel "Praise The Lord" Lesson. This is a very easy cake to make. Close up of the Psalms 150:1-6 Scripture. Angel template stuck down in cake. 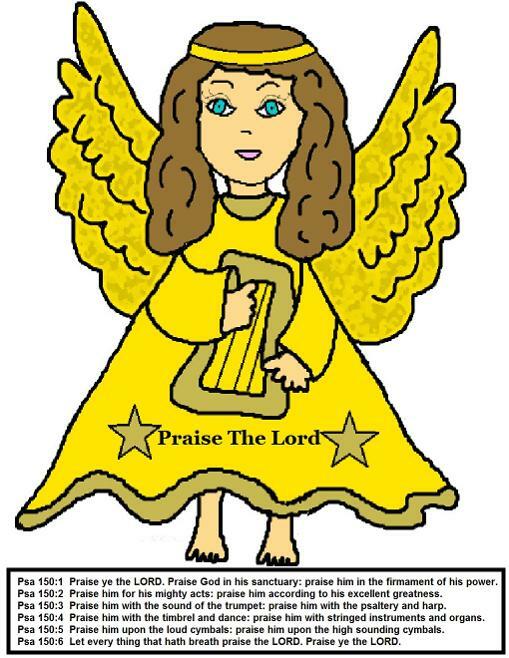 Here is the Printable Angel Template to print out.